Bears are wonderful animals, smart and fast and adaptive. They often stand as living symbols of the wilderness. Grizzly, polar, and black bears stand out as some of the most beautiful animals on our planet and have proven able to survive in environments from dense rain forests to arctic ice shelves. Sometimes they forage, other times they hunt, and when lucky, they fish. When undisturbed in the wilderness, bears are truly majestic. Though mostly harmless to humans, under the wrong circumstances, bears can pose a threat to people out in the field. So how best to address the issue of bear safety? This threat is the source of one of the everlasting wilderness debates. How do I stay safe around bears? How to stop a charging bear. I have found that this debate boils down to an argument over which tool is best for defending you against a charging grizzly or an agitated black bear. Should I carry bear spray? How about a handgun or shotgun or a rifle? People on the internet argue without end, and I have often seen these people insist that they have the one true solution. To some, their answers seem almost dogmatic, as if the disagreement is somehow unholy. This debate can get pretty heated, often getting political or personal. Whatever the conclusion, it is almost never productive. 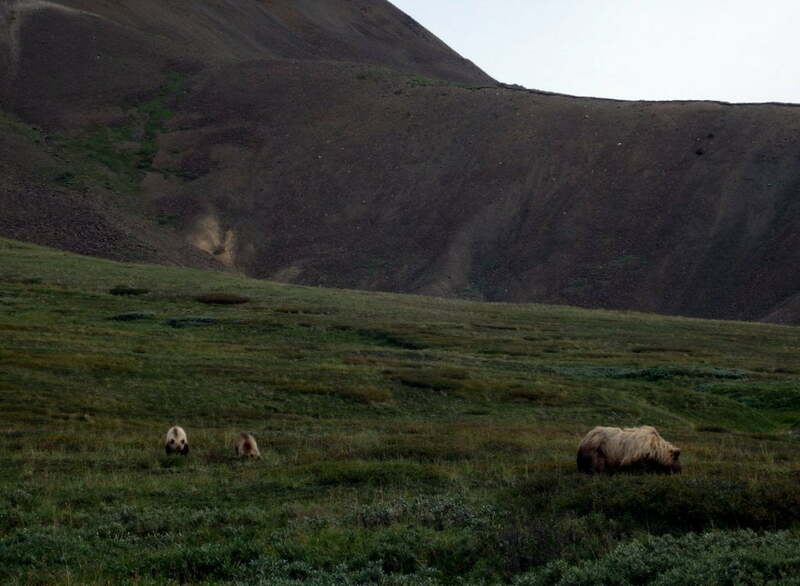 A Denali grizzly doing what a Denali grizzly does near Polychrome Pass. That is because these questions and supposed solutions all miss the real point, but to show you why that is, I need to switch topics for a moment. Last year, I took a class on nuclear security, taught by a former Air Force intelligence officer who wrote nuclear targeting packets for Strategic Air Command, among other things. He loved to tell us stories which were relevant to our topic, and one day he told us a tale of a morning briefing that got him in trouble. He delivered a briefing to the crews of B-52 nuclear bombers, what their routes and payloads were if the Cold War happened to turn hot that day. As he reached the end of his briefing, he told the crews that despite all their preparations for war, if their aircraft were to ever leave the ground in anger, the war was already lost. The simple act of ordering the bombers to take off with intent to strike the Soviet Union indicated that America, and Russia too, was already defeated. His commander, a full bird colonel, gave my professor, then a first lieutenant, an angry talking to later that day. But even the colonel had to admit one thing: that the young lieutenant hadn’t been making things up. Official Air Force doctrine supported my professor. If the bombers ever indeed took flight inbound to Moscow, we had already lost the war. This is true because the use of force indicates that avoidance, deterrence, and de-escalation have all failed. If the moment ever comes when you find yourself using any weapon in anger, things are already out of hand. The true way to stay safe in a dangerous world is by finding peaceful ways of mitigating conflict. The same holds true for bear safety. If you ever find yourself spraying or shooting a bear, things have already gotten very, very bad. Odds are, you’ve made some seriously poor choices. So how do you ensure this never happens? A grizzly sow with her cubs. There is little more beautiful than a young bear, but the presence of young can trigger defensive mechanisms in the mother. The first step to making sure bears remain non-threatening is to keep your food away from them. If you are car camping, pack everything away in your car when not cooking or eating. If it even remotely smells of food, put it where the bear cannot get it. This includes toothpaste and chapstick and sunscreen. If you’re out in the wilderness, you should use something like a bear can, ursack, or tree hang. Proper control of smellables is possibly the most important aspect of bear safety. All three of these, if used properly, will ensure that bears do not get your food. Remember how I said bears are smart? Once exposed to human food, a bear has learned to associate humans with food. Only at this point does your once harmless bear become truly dangerous to humans. There are more ways to keep bears out of your food, but these are the big three. I’ve used all of them, and I have never once had an issue of a bear getting any of my food. Me cooking breakfast pancakes out in the field. Note that the revolver never had to leave its holster because after eating, I properly secured all of the smellables. Next, be careful of where you pitch your camp and store your food. If you’re in a campsite, your options may be limited, but in the field, you have a dizzying array of choices. So here are some general rules. 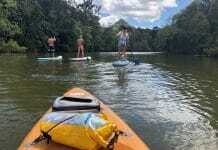 Pitch your camp well away from any trails or river bars. These are animal highways and if Smokey Bear stumbles onto your tent at two in the morning, you and the bear are in for a nasty surprise. Also, never, never, never cook or eat or do anything with food in the area you plan to sleep at. Cook and eat at least a hundred yards away. 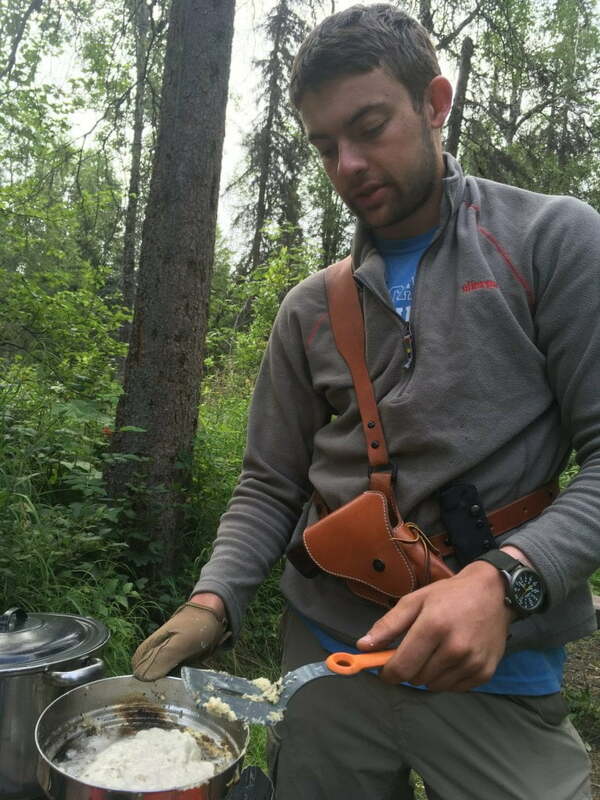 When you’re all done eating and cleaning for the night, store your food in a new location, at least a hundred yards from both your camp and cooking sites. If it smells like anything other than you, do not keep it in your camp. And as you walk along the trail, or off the trail, make noise. Believe it or not, bears really want nothing to do with you. As far as that grizzly sow can tell, you are a weird looking two-legged monster that makes strange and frightening noises. Use this fear to your advantage. If bears can hear you a long way off, they will most likely run away from you. And make sure to keep attentive as you walk. Stopping for a moment to survey the sunrise. Taking these little pauses can ensure that you and the wildlife avoid surprise encounters. The wilderness is definitely no place for headphones. Check behind you sometimes; it’s not unheard of for a curious adolescent bear to stalk people who are a bit too careless. I even know people who honk an air horn as they move through something like willow brush to make absolutely sure no bear is near them. While I find that a bit annoying, carrying on a conversation is entertaining and actually keeps you safer. Alright, so secure your food, keep it away from your camp, and make lots of noise. But I can hear some people asking: What if the worst happens? That’s a fair question. I said above that if you have bear issues it’s probably your fault, but that’s not always true. You could be in dense brush, beside a river, in the pouring rain. You’re walking along, nearly blind and deaf from the rain. Your bear call doesn’t travel more than five feet here. And you stumble on a freshly killed caribou, with a grizzly sow standing over it. This is no one’s fault, yet the situation is suddenly fraught with danger. First, an important note, grizzly bears, black bears, and polar bears all behave differently. I have no experience with polar bears, so I won’t touch on those beyond noting that they are unique among bears because they actively hunt humans. As a result, polar bears are considerably more dangerous than are the others. 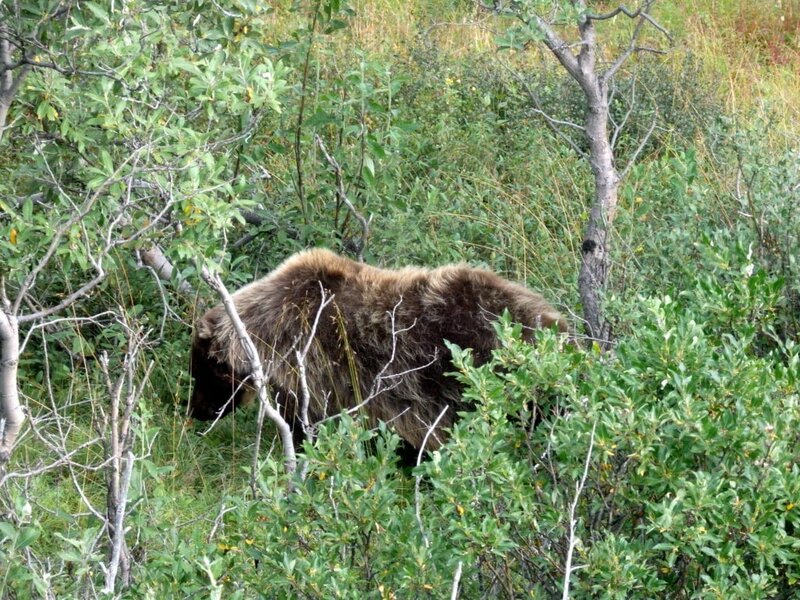 Hidden in the willows: we got way too close to this blonde grizzly. Luckily, we saw him first and left him alone to dig for roots. Black bears are a mixed bag. Mostly harmless, they typically run away if you so much as clap at them. However, there is a twist in here. If the bear approaches you, stand tall and make noise. Never, ever run from a bear, never. This will trigger its chase instinct. If a black bear actually charges you and makes contact, it almost certainly aims to eat you. Fight for everything you’ve got because otherwise, you won’t get a second try. Grizzlies, on the other hand, can be much more territorial and often seem more aggressive than black bears. They may shadow you, but will almost always leave you be. Most grizzly charges are bluffs, and they waive off at the last second. As already noted, never run from a bear. If a grizzly does get on you, your best bet is to play dead. The bear almost always is simply trying to assert territorial dominance and does not plan on killing you. A lot of grizzly ‘maulings’ are just the bear swatting you as a reminder of who is the boss. Of course, if it gets more serious or continues for more than a few minutes, fighting may become your only option. And we have now returned to our original question: what tool is the best if you do have to fight? The answer, there is no one answer but I can give a general outline. Can you spot the bear spray I’m carrying? It’s on my left hip, barely visible. Spray is much, much easier to carry than is a firearm. Bear Spray is a super concentrated form of mace, similar to what a lot of people keep in their pockets every day. It causes temporary blindness, uncontrollable sneezing, and difficulty breathing. I’ve never been bear sprayed, but I have seen someone accidentally spray themselves. The results were less than pleasant and certain reinforced my faith in the spray. In addition to being effective, spray is very easy to carry. Sometimes, I’ll even forget that I’m carrying it. The spray shoots out in a fine mist, not a stream like normal mace. With an effective range of about fifty feet, it’s a close quarters tool. However, bear spray struggles to cope with wind, so keep that in mind. It is pretty easy to use, and aiming is simple. The manufacturer advises you to spray in a z-shaped pattern to ensure a hit. 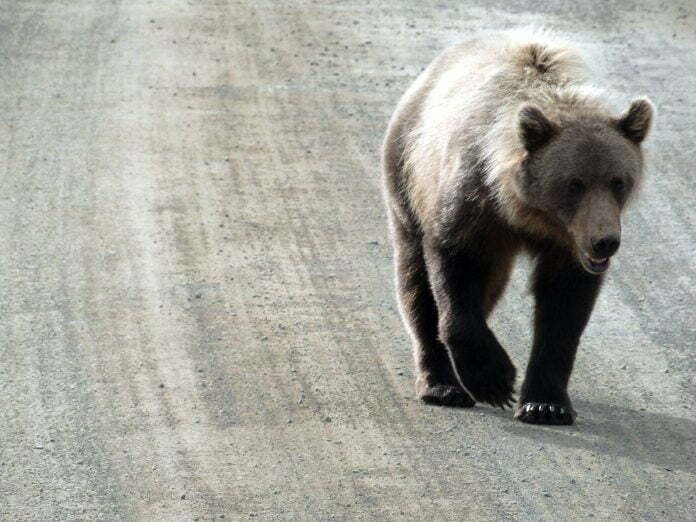 Though I have never seen a non-human animal hit with bear spray, reports suggest that a sprayed bear acts as if it has hit a wall. Naturally, since it’s a fine mist, you are likely to get some on yourself, so be careful in heavy winds. 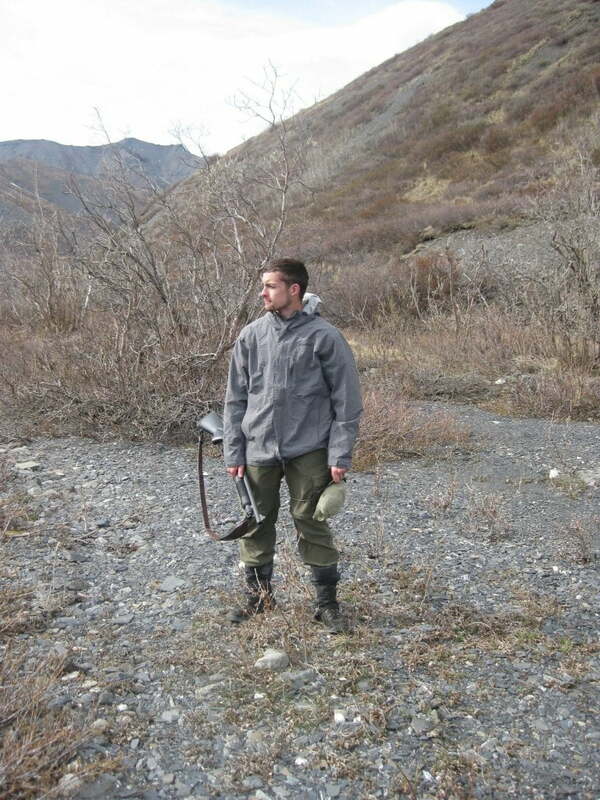 Me with a shotgun on the Savage River in Denali. I do not recommend carrying long guns for defense. That thing was like a boat anchor, definitely not worth it. But in this picture I’m 19, so I chalk it up as a learning experience. Firearms hurl small bits of metal at sub-orbital speeds to poke holes in a target. Don’t believe people who insist that only the largest of the magnums will drop a bear. Grizzlies have fallen to the humble 9mm Luger and .223 Remington. The keys with a firearm are shot placement and bullet construction. This may be a bit graphic, but if you put a solid, non-expanding bullet through the animal’s brain, it will die. That is, of course, a complication on two different levels. Killing anything is bad enough to start with, and killing a bear is somewhat worse. They are wonderful animals, and though I am a hunter, the idea of harming a bear makes me more than a little uncomfortable. But ultimately, I can’t make that choice for you, so you need to decide if you are comfortable with taking a bear’s life. Second, a vital note on firearms, they are much, much more difficult to use than is bear spray. The spray only needs a hit somewhere in the face to work. A bullet needs to find the perfect mark. Using a firearm requires real skill and practice. 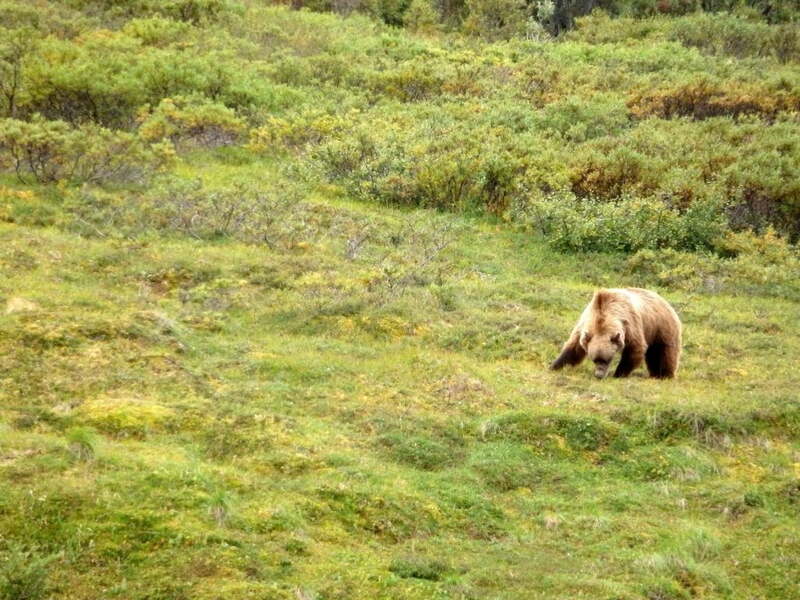 A grizzly on the Denali Park Road (this photo was taken from the safety of the park bus). Notice the tourist in the background snapping pictures. 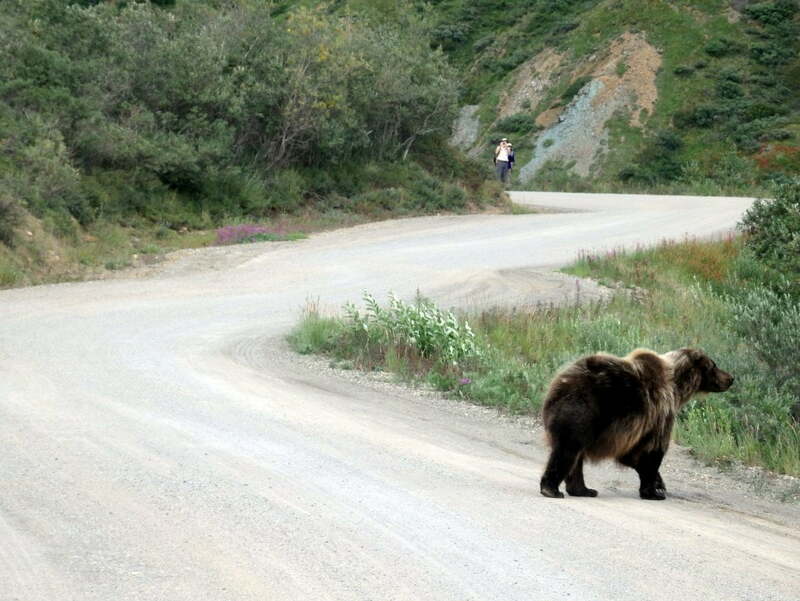 If you are this close to a bear and the animal does not notice you, back away slowly. No photo is worth aggravating that guy. In the end, the best bear defense is the tool you use the best and have confidence in. Bear spray is pretty easy to use and is proven effective. A firearm, however, requires skilled use and tens or hundreds of hours of dedicated practice. I’ve met people who bought a .500 Magnum for bear defense but could not hit the broad side of a barn from the inside, because the recoil is so severe. If you are anything less than an excellent shot, leave the gun at home. The only thing worse than an angry bear is a wounded bear. As for me, I’ve carried it all. I feel comfortable with both options and really don’t have a solid preference. They both work, you just need to choose what works for you. I suppose if I absolutely had to pick one it would be a medium-sized handgun (only where legal! ), but bear spray is also excellent. But do you remember how I began this article? If you ever find yourself using force, things have already gone terribly awry. Store food away from camp, and keep your food and other smellables in containers bears can’t open. And if you do choose to carry some form of physical protection, train in its use, become an expert in it. But in the end, remember that bears are not the most dangerous things out there. River crossings, glaciers, and bad weather all take turns sharing that title. 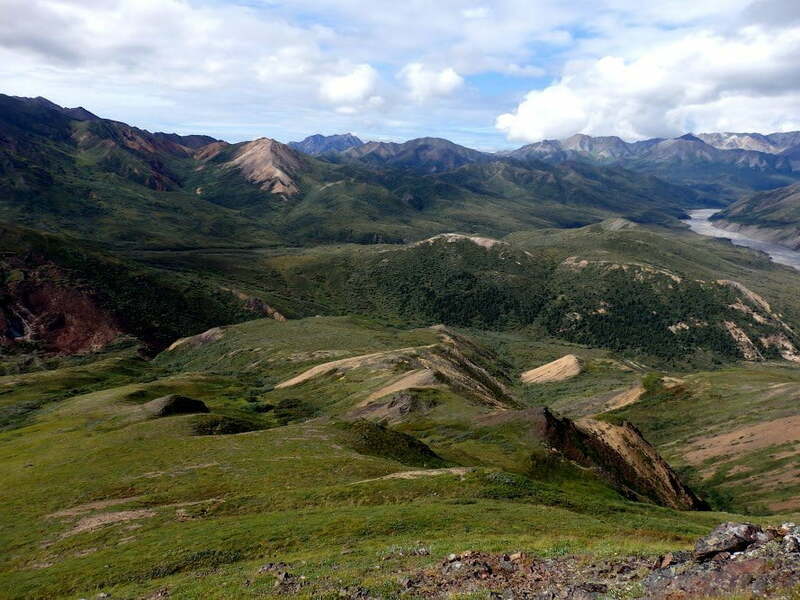 A view of the wilderness from near Polychrome Pass. No doubt there are countless bears out there. But just exercise some basic precautions, and you and the wildlife will be fine. Use common sense out in the wilderness, don’t mess with the wildlife and the wildlife won’t mess with you. I have spent months in the wilderness, from North Carolina and Wyoming to Washington and Alaska. I have never had a single bad rrun-inwith a bear. This is despite being very close to them on occasion. Never once have I felt threatened, because I use proper precautions. I’ve never surprised a bear, never stored food in my tent. And, unlike some tourists in videos gone viral, I don’t feed the wildlife. 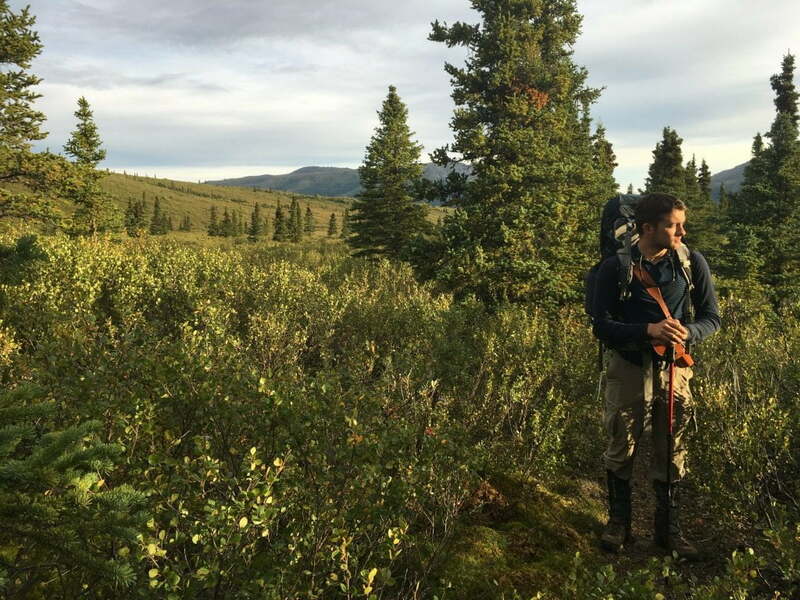 The wilderness really isn’t a particularly dangerous place, and by taking a few simple precautions, you can ensure it is even safer for you, and those around you. So stay safe and have fun! And never forget to take pictures! I'm a senior at the University of North Carolina at Chapel Hill studying Medieval History. 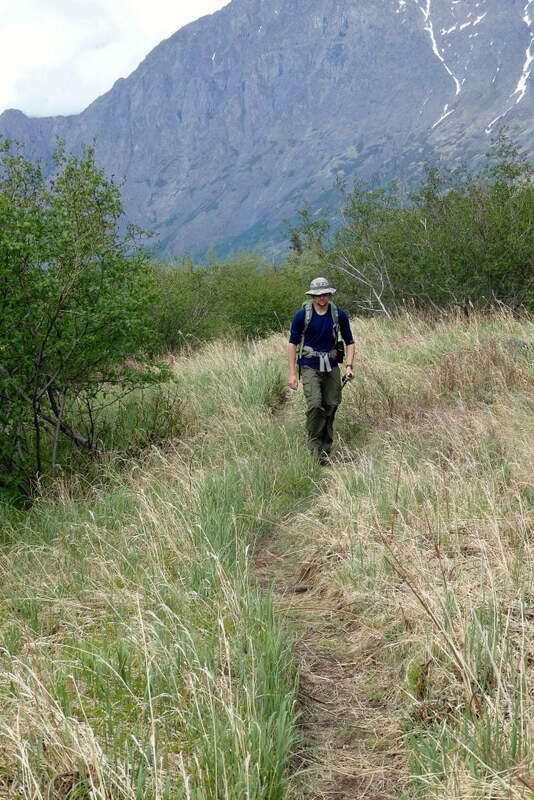 I love everything to do with the outdoors, especially backpacking. 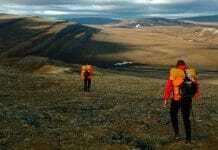 Awesome photos from Polychrome Pass! I hiked here fifteen years ago. What a truly gorgeous place! Thank you! Polychrome is great.